I admit it. I love the Stones and have for a long time. Most of all I am fascinated by Keith Richards. So when my mom offered to draw any one of them, I chose Keith, thinking that she would immediately be attracted to the wrinkles of his life, crevassing his edge-of-death, tour-worn face. I thought she would too be attracted to Keith’s story, his lows and his surprising survival. I gave her all kinds of pictures to use as inspiration, and even then I had a ton of Mick Jagger photos at the ready in case Keith wasn’t meaty enough a subject. 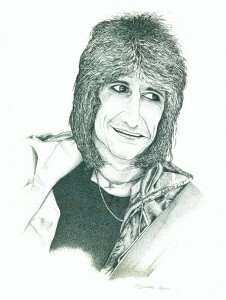 But as she looked through the group pictures, she decided to draw Ron Wood instead. She saw more than a guitarist – an amazing one at that – in Ronnie. She felt that he was much more than the just the Rolling Stones. More than just The Stones? Blasphemy! Sure, I had his albums from Jeff Beck, Faces, and even an underproduced solo project. But why him; and what did she see in him? By the way, an album is a large 2-sided vinyl disc (also referred to as a record) of recorded songs, that can only be played on a record player at 33 1/3 rpm (revolutions per minute). Smaller versions called singles could be bought and played at 45 rpm, and despite the name they actually had two songs, one on each side. The less popular side was often referred to as a B-side because it was usually just filler since the thing had to have two sides. There were 78 rpm records also, but they didn’t always have music. These were all used in times of yore, prior to the invention of 8-tracks, which will be covered at another time. Back to Ronnie. As it turns out, what mom intuited was that he was more than just a musician. Just a musician? What is wrong with this woman? A little research and I discovered that he was an artist of many dimensions and he has a collection of work that I continue to covet. This was all before Google, so it wasn’t like she had researched him, but LA is really just a small, gossipy town, and she was after all living smack in the middle of West Hollywood. Another by-the-way – before Google, MySpace and Facebook, people found out about other people through newspapers, magazines and even by talking to each other personally. Sometimes they used telephones that were attached to wall plugs and electrical outlets inside of buildings. But people weren’t always in their buildings so you had to leave a message for whenever they got home. It sometime took hours to update other people, and that was only if they wanted to be updated and called you back. Hours. Back to Ronnie again. As you can see, Elizabeth did end up drawing him from a picture in which he wore a gold lame windbreaker (don’t ask, it was the early 80s) along of course with detail of his signature hair, which has not changed much for 35 years, something that he and his cohort Rod Stewart still have in common. All in all, it felt kind of strange for my mother to school me on a rock and roller, but then again, my mom totally rocked. This entry was posted in The Art of Life and tagged Drawings, Elizabeth Ayers, Pen-and-Ink, Ron Wood, Ronnie Wood, stippling by Dawn Martin. Bookmark the permalink.